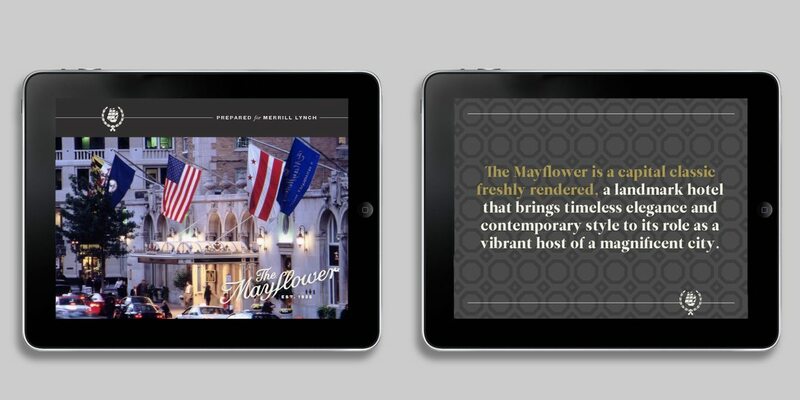 The Mayflower relaunched in July 2015 as an independent hotel, ready to again take its commanding post as a gracious ambassador of a powerful international city in the D.C. landscape. 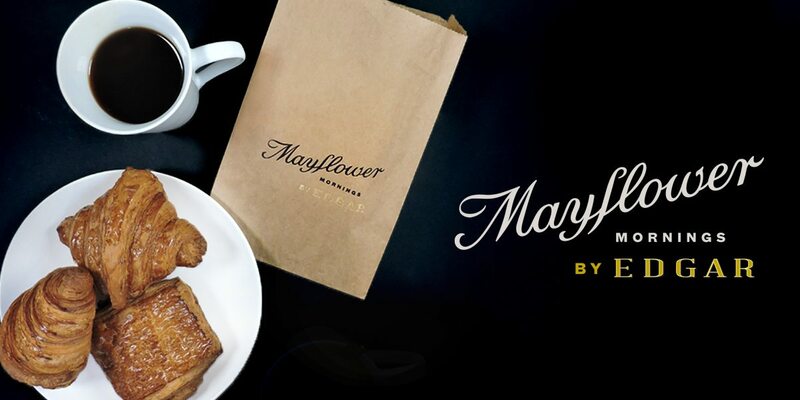 Tapping into the rich vein of its storied past and celebrating its proud heritage as an iconic historic destination, Korn recast The Mayflower as a vibrant and elegant social hub — restating its distinction as the capital city’s foremost host. 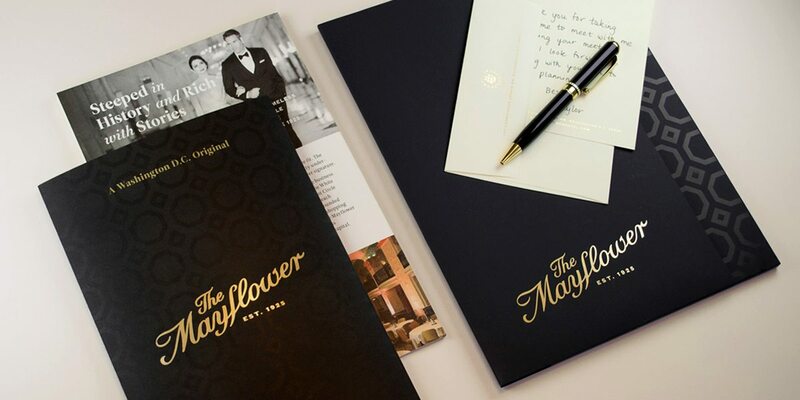 When engaged by ownership, Rockwood Capital, to help re-flag and reposition the Mayflower as a fully independent hotel in the Autograph Collection, we took a holistic approach – taking a long look at the physical features of this landmark property and digging deep into its history to weave the connections between the hotel’s glorious past and its unassailable presence on the DC hospitality landscape. 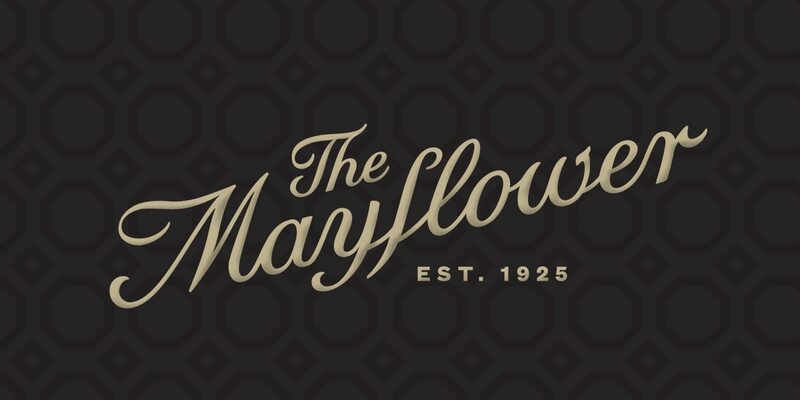 The heart of the rebrand was less new invention and more a hale and hearty respect for the original identity and story of The Mayflower – a restoration, of sorts. 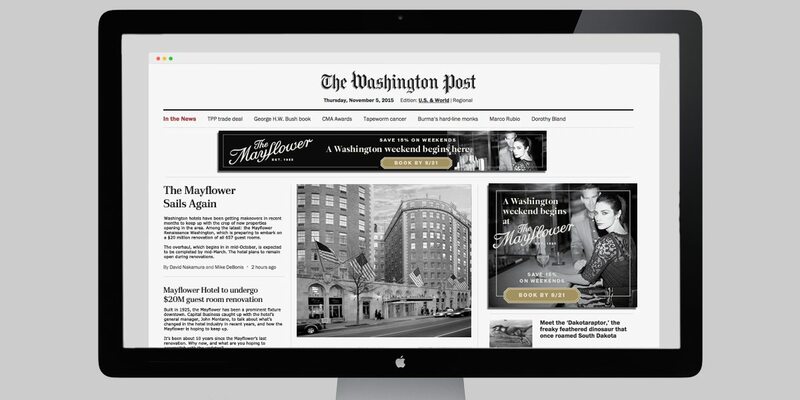 First we surfaced the hotel’s “born on” date to signal its longstanding presence as an iconic Washington DC destination “EST. 1925.” We commissioned type designer, Maggie Putnum, to redraw the original logotype and return the typography to its former grandeur. Using original signage and historic captures of the initial type treatment for reference, care was taken with each curve and accent, resulting in a new logotype that rests at a fresh upward angle, locked up with the EST. 1925 tagline. 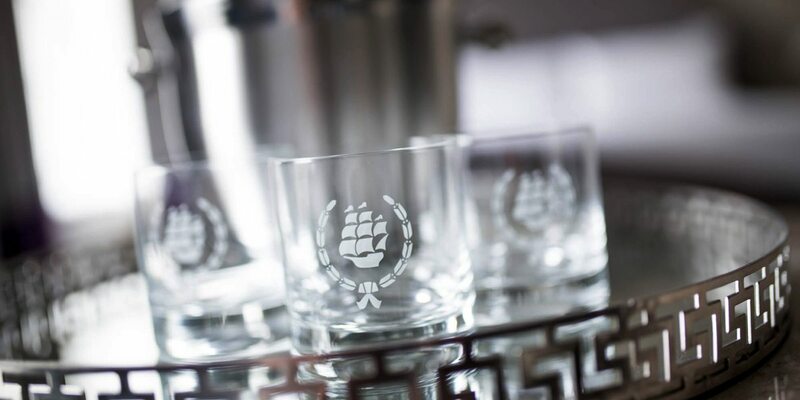 Having unearthed multiple graphic interpretations of the famed namesake ship, we decided to edit and port forth only the simplest variation of the ship with its regal wreath surround – a tribute to the Mayflower’s past and precious contribution to its brand longevity. With this “heart of the brand” to work outward from, we paired the logotype with a system of typography that is both respectful to the past but bold and contemporary in personality. What property could better own – and flaunt – its gilt? Intricate ceiling medallions and architectural ironwork from the hotel’s massively gilded grand lobby inspired the warm gold and glistening flourishes in the brand’s refreshed palette while providing graphical patterning elements. 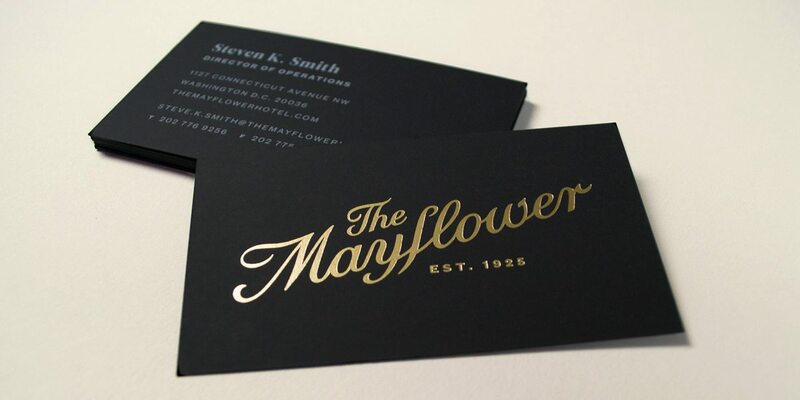 Lending to its “black-tie” status as host to elite and international guests, the brand invokes elegant foil stamping against matte blacks, with warm whites grounding the palette with confidence. 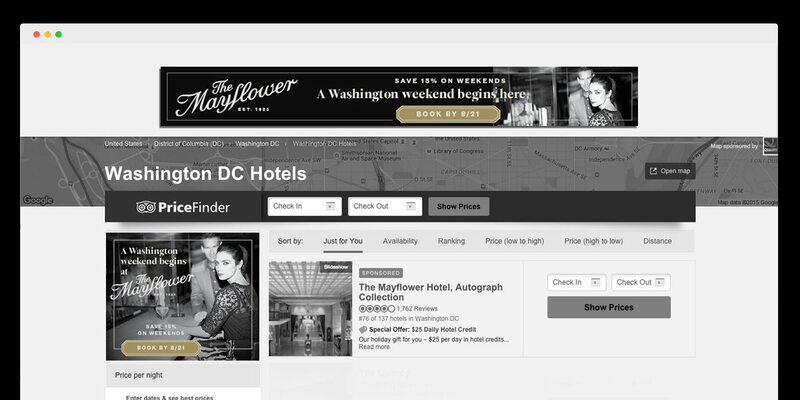 For nearly a century, The Mayflower’s draw has brought D.C.’s power scene and personalities to its doors, filling the hotel with a quintessentially capital spirit – and with a signature appeal as iconic as the hotel itself. A multi-million dollar renovation spearheaded by The Gettys Group, interiors design firm, maintained the hotel’s historic pedigree while updating its look, presenting a sophisticated blend of elegance, grace, and contemporary taste. In sync, Korn introduced a newly vibrant blue and rich magenta as new twists on the quintessential American red-white-and-blue palette that came into play as smaller accents and inspiration for new front of house uniforms. 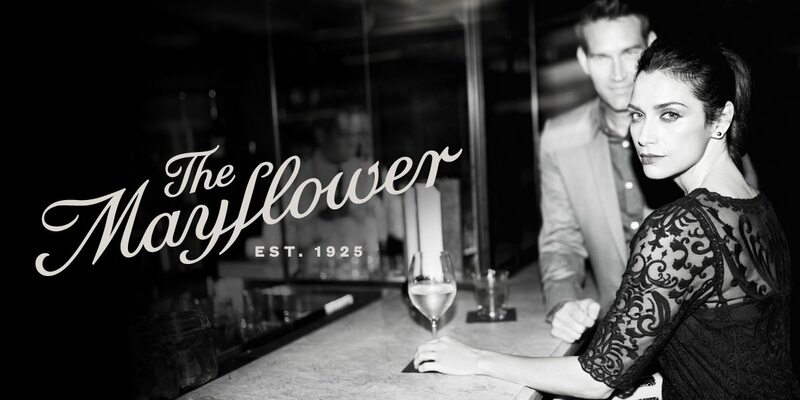 Photography has always played a role in The Mayflower story—a timeless tale Korn chose to evoke full-bore with lifestyle photography and imagery that renders beautifully in both black + white and in color. 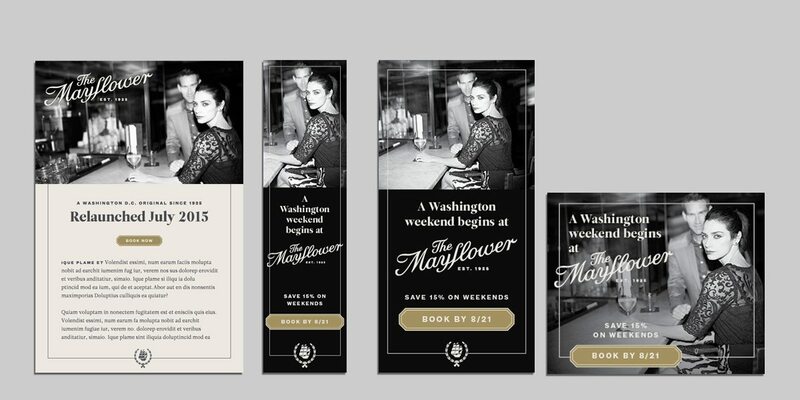 Set at the intersection of iconic meets independent, we styled the photography to bring a heady combination of sophistication and seduction back into the brand – and to play a prominent leading role in the hotel’s digital marketing launch campaigns.